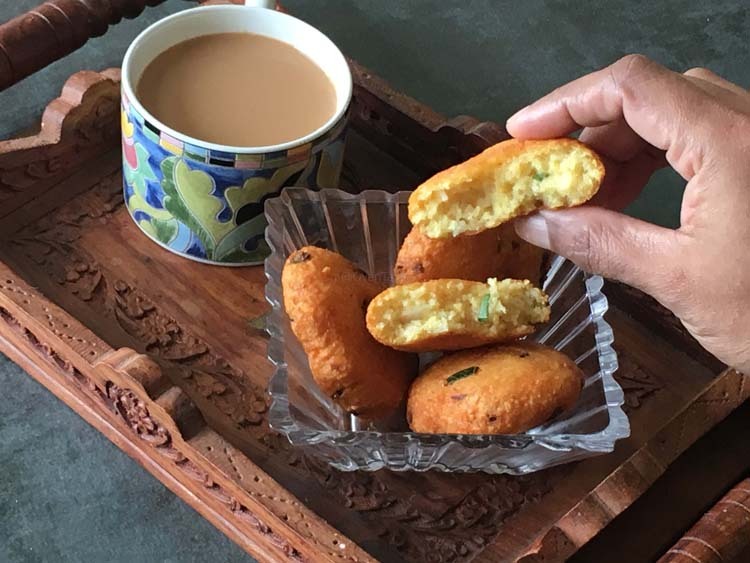 I remember coming home after a long day of school – trust me it was LONG – and munching on these banana fritters while sipping a hot cup of chai. The In case you are wondering, I had a very Indian upbringing – evening chai is in our blood. Well those were the days, now if want these I have to make them myself. 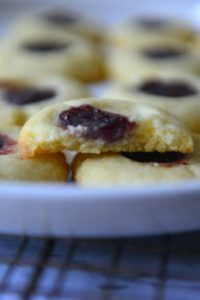 No, I am not complaining, these are super easy to make. So here is undan pori – a satisfying and filling after school snack. 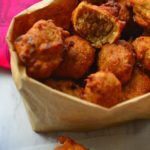 These are fritters made with whole wheat flour and bananas – in other words whole wheat banana fritters. 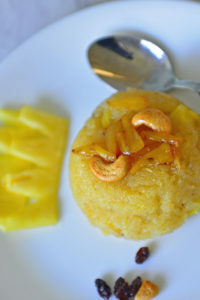 Mashed bananas and a pinch of baking soda keeps these soft and spongy while jaggery adds a little sweetness. What I love most, as a cook , that I don’t have to plan ahead. The ingredients for the batter are pretty much pantry staples. 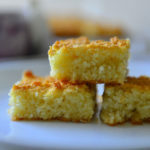 It was one of the go to recipes when kids in the neighborhood used to gather in our living room. It is very common to find bananas for breakfast and snack in south India. There are snacks, both sweet and savory, made from bananas and their close relative – plantains. This is a recipe that uses over ripe bananas. If you are tired of making banana bread give this a try. Banana bread recipe and undan pori recipe use similar ingredients, but undan pori uses more nutritious ingredients.When fried correctly these do not absorb much oil either, keeping the calories low as well. Unda in Malayalam means ball and pori refers to anything fried. Literally this translates to something that is round and fried ! It is also called Gundu – loosely translated it means round , fat :-). This was a favorite for tea stall owners, and at times they Gundu they make were sturdy enough to be used as cricket balls. When made right these are light, fresh and delicious. For tea stalls this was a great way to re-purpose any left over rice and wheat mixes for breakfast. There is always a market for fried sweet (any)thing! Technically you could mix water , sugar and flour together and fry to make a sweet fritter. Adding bananas to the batter makes it more moist and sweet. 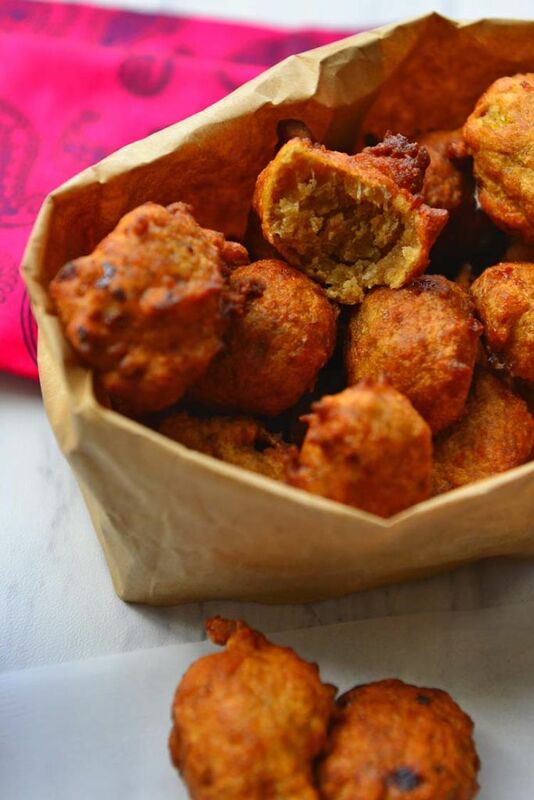 These kinds o f fritters – where veggies or fruits are mixed with flour and fried are called bonda in South India. 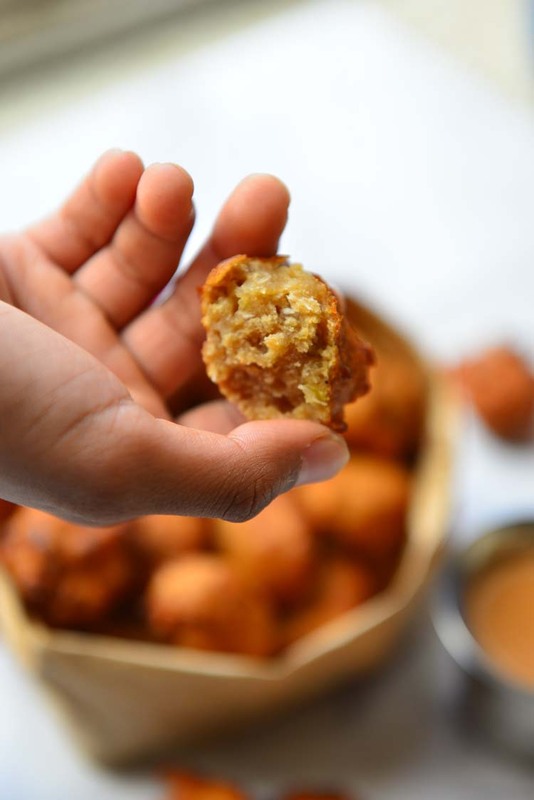 So you might find these being referred to as banana bonda or sweet bonda ! Back in Kerala when mom makes it, she uses the small bananas – like the manzano or apple or lady finger bananas. These have a slightly different flavor and some even have a little tang to it. There is a more involved recipe using similar ingredients – unni appam. The traditional recipe for unni appam is ever so lightly leavened with natural yeast. Undan Pori on the other hand resorts to a pinch of baking soda. The batter is made with a high proportion of wheat flour and a little rice flour. Rice flour is added for crispness. You could change the proportions , but if using more rice flour increase the bananas and the leavening. The higher proportion of the wheat flour keeps the fritters soft inside and prevents it from hardening immediately. Usually the tea shop undan pori will be spherica and mad e with a sot dough. But these do not look like the perfect balls, to be honest these resemble alien figurines or my early (ahem! ) attempts at clay modelling. The reason is that I make teh mix into a thick batter than a soft dough. The higher proprtion of water makes the fritters more soft and spongy. More over this makes the process hands free – no rolling or kneading the dough ! So here is the recipe ! 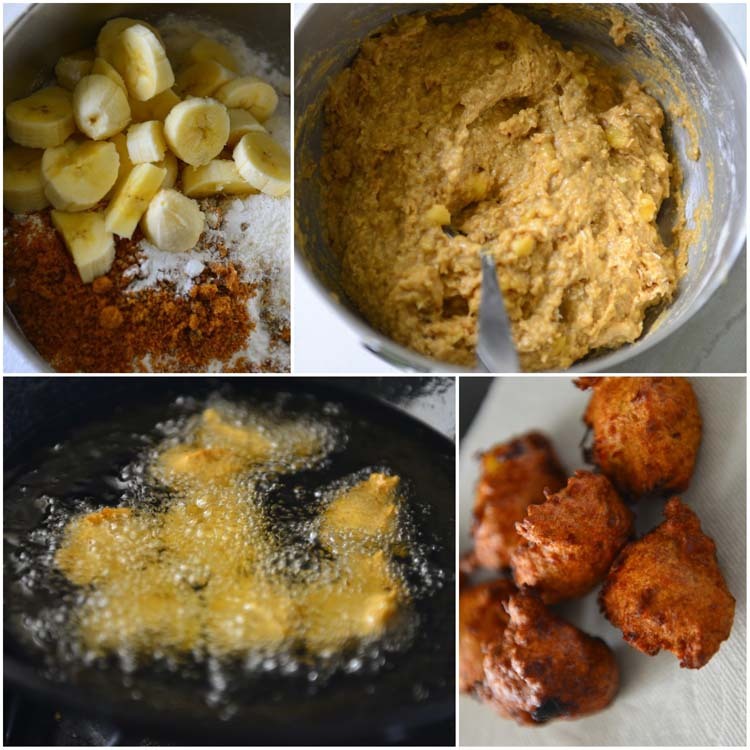 Easy banana and whole wheat fritters. Take all the dry ingredients in a bowl and mix well together. Add coconut and sliced banana. Mash the banana into the mix with the help of a fork or spoon. Add grated jaggery, cardamom powder and water to make a thick batter (See Notes for jaggery). Let the batter rest for 15 minutes. Add enough oil in a pan to cover the bottom by about 1 inch and heat. Drop a little batter into the hot oil.if it sizzles and slowly rises up to the top the oil is at thet temperature. If it burns turn the heat off and let the oil cool a little before proceeding. If there is no vigorous activity around the dropped dough the oil is not hot enough. Heat longer and try again. Drop the batter by spoonfuls int the hot oil. Fry over medium heat flipping once or twice to brown evenly on all sides. 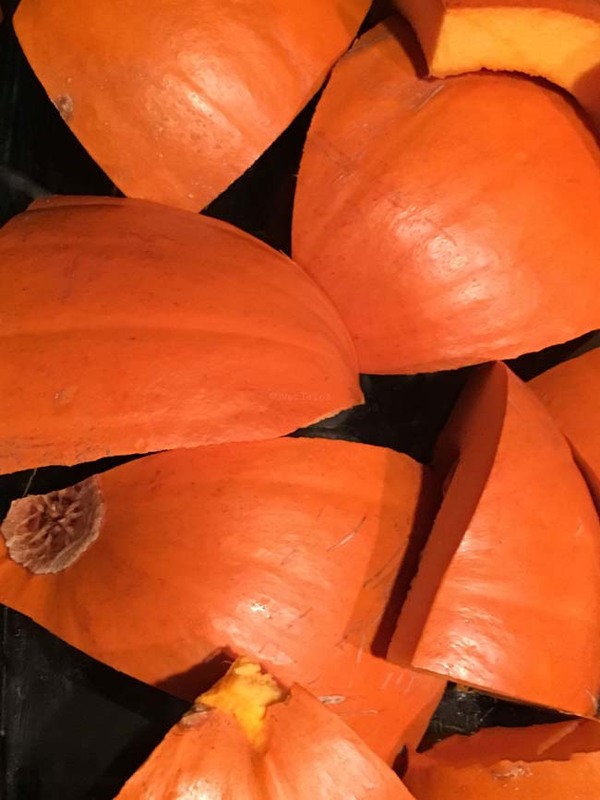 Remove with a slotted spoon and drain them on kitchen towels. Serve warm. These are best served fresh. Once cooled store in the fridge in an airtight container for up to 2 days. Warm before serving . 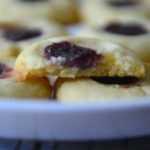 These can be made with all purpose flour as well. Use ripe bananas. When using small bananas double the number. If using blocks of jaggery or when unsure of the purity of jaggery melt it in 1/2 C warm water and strain. When jaggery is not available use brown sugar. 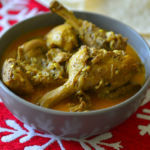 Fresh or dried coconut can be used in this recipe. I prefer dried coconut as it provides a nice textural contrast. The consistency of the Undan Pori batter can change from loose dough to thick batter. The thick batter makes for softer fritters. 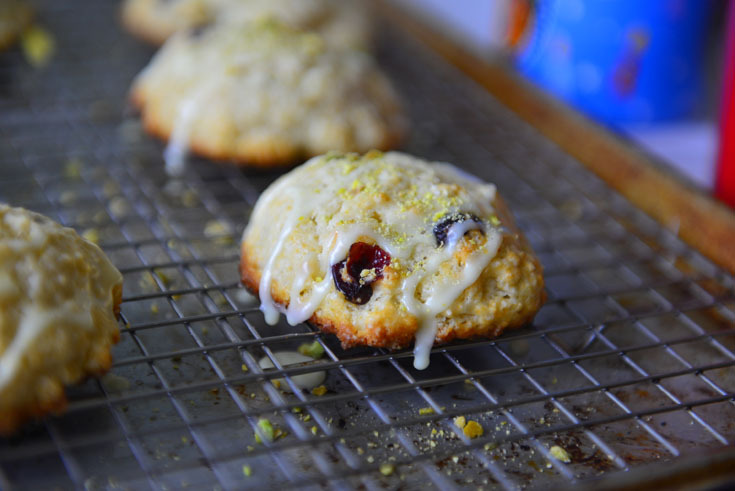 See why I love making these (almost) as much as eating them ! These looks so good and something so new to me! 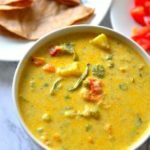 I always have ripe bananas on the counter and even my pickiest of kids will eat anything I throw them in, so for sure this recipe is a winner! Thanks! Hope you like it as much we do ! It’s amazing, I am always doing it without banana, and now thank you for the idea. It’s time to upgrade my recipe. Banana makes it more moist and soft, but these are best eaten fresh.